Ancient Indian precedents for the notion of mindfulness in current usage are related to learning by rote. This appears to have been based on an intentional training in memorizing texts without drawing inferences, in order to avoid interfering with precise recall. Such absence of inferencing relates to the Buddhist notion of bare awareness, a modality of mindfulness that aims at staying with bare sensory experience without additional layers of associations and mental proliferations. The same basic mechanism appears to be relevant to understanding the potential of mindfulness to counter addictive behavior, such as smoking. Anālayo, B. (2019b). The emphasis on the present moment in the cultivation of mindfulness. Mindfulness, 10, 571–581. https://doi.org/10.1007/s12671-018-1074-1. Garrison, K. A., Pal, P., O’Malley, S. S., Pittman, B. P., Gueorguieva, R., Rojiani, R., Scheinost, D., Dallery, J., & Brewer, J. A. (2018). Craving to quit: a randomized controlled trial of smartphone app–based mindfulness training for smoking cessation. Nicotine & Tobacco Research, 1–8. https://doi.org/10.1093/ntr/nty126. McKeering, P., & Hwang, Y.-S. (2018). A systematic review of mindfulness-based school interventions with early adolescents. 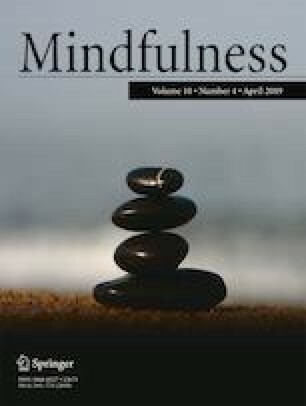 Mindfulness, 9. https://doi.org/10.1007/s12671-018-0998-9.